Liverpool edged ever closer to top-four qualification with a comfortable 3-0 victory over Bournemouth, much to the delight of supporters. Jurgen Klopp’s side capped off an excellent five days by earning another important three points in the final push for a top-four spot. Sadio Mane got the Reds off to a dream start converting on the rebound after just seven minutes, with Klopp’s side deservedly going in ahead at half-time. 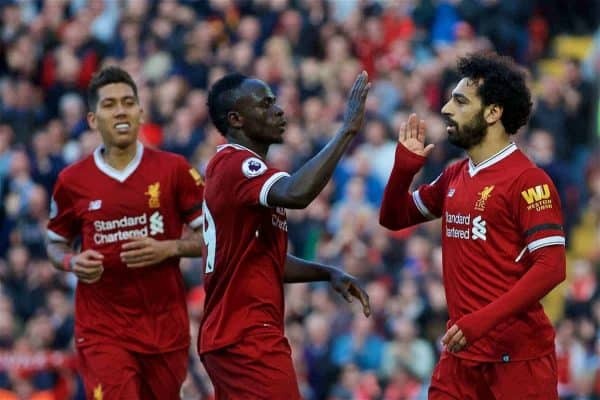 The dominance continued and that man Mohamed Salah doubled the lead with a superb improvised header into the far corner, before Roberto Firmino wrapped up victory in the final minute with a clever finish. The Reds now sit on the cusp of completing successive top-four finishes for the first time since 2009, which would be a very impressive achievement in what is turning into a memorable campaign. Here’s how supporters reacted to the win across social media and on our forums. 3 points baby. We move up to third. Great performance today lads. Let's continue it. – Fullmetal on the forums. Awesome performance. Still had the hunger after last week. Shame on Lovren injury but reds go marching on ! Great performance today. Some of the football was a joy to watch. What a talent we have in Trent. Serious footballer. The front three have scored again. Lovely. Salah, Firmino & Mané – The best front three in world football. GOALS, GOALS, GOALS! #LFC ??? just the seventh game this season where Mané, Salah, and Firmino have all scored. – Danny on the forums. Eighty goals between them but your MCM thinks they’re not the best front three in the world. MANÉ, SALAH AND BOBBY FIRMINO, OUR FRONT THREE ARE THE BEST IN THE WORLD ??? People who still aren't convinced that Roberto Firmino is one of the best forwards in football, don't deserve the privilege of watching the sport. 3 points …3 goals..clean sheet..
Mane and Bobby loving each other in the stands. This team is really incredible. They’re having fun and enjoying each other. Invaluable. This is the most balanced Liverpool team of my lifetime. Frightening going forward and solid at the back.